South Adelaide have made it three wins in a row to kickstart their 2016 campaign after a comfortable 71 point win over reigning Premiers West Adelaide at Old Skool Round on Sunday afternoon. It was a tale of two teams heading in different directions, as South now sit second on the ladder with three wins from three games, while the Bloods are now anchored to the bottom of the table thanks to a third consecutive loss. Signs were positive early for the Panthers, who had started their previous two games sluggishly and leaked goals in the opening minutes to both Glenelg and Woodville-West Torrens. Against West, South set the tone early and jumped out to a four goal lead in the first quarter and continued to build that advantage at every change, including a seven goal to one third quarter blitz. High flying Brett 'Hollywood' Eddy starred up forward, banking eight goals to take his season total to 13 and move into first place in the race for the Ken Farmer Medal. Eddy also played a role in setting up numerous scoring chances for his fellow forwards and was ably assisted by Ben Haren and Sam Overall, who slotted three goals a piece. Jake Veide was once again released onto a wing and continued to show his outside game can be a devastating to opponents as his ability to lockdown at the stoppages. Once again sporting his signature shaved head, Veide's all around performance included 24 touches, eight marks, seven tackles, seven inside 50s and he also led the Panthers in team positives. New recruit, Cameron Hitchcock (24 touches, six marks and two goals) was also impressive on the wing and across half forward, while Xavier Gotch and Nic Schwarz provided their usual grunt work in the middle and also showed off the offensive side of their game, kicking three goals between them. Goals were the highlight of the day, as the Panthers banked their highest score since their 2014 Semi Final win over Sturt at Adelaide Oval, eclipsing that 21.11 - 137 mark by a point. However, credit should also go to South's defence, who made a West Adelaide side that was the second highest scoring team in the SANFL in 2015 look ordinary offensively. Vice Captain, Tarak Redigolo was especially impressive, holding dangerous forward Aaron Fielke to just 10 disposals and a single goal. 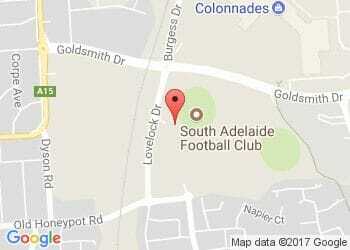 South Adelaide now face their first away game of the season as they travel to My Money House Oval in Elizabeth to take on Central District on Saturday 16 April from 2:10pm. South Adelaide's Reserves have joined the winners column for the first time in 2016 thanks to a thrilling last gasp victory over West Adelaide on Sunday afternoon. Connor Fairlie was the hero for the Panthers as he roved the ball from a stoppage in the goal square and snapped the winning goal with only seconds remaining and helping South record a four point win against his former team. It was a hard fought win for the Reserves, who worked their way to a 10 point advantage at quarter time but found themselves facing a four point deficit at the final break and had to claw their way back into the lead in a tightly contested final term. Best on the day was Rhys Bartram, who collected 26 touches and five marks on the day and was able assisted by athletic wingman Tyson Brown (23 possessions and 10 marks) and young midfielder Ben Heaslip (24 touches, eight marks and a game high nine clearances). Luke Durdin also played an important role across the backlines, while Jackson McMahon (three goals) presented well throughout the game and Cody Szust (19 disposals and a goal) was lively up forward. The Panthers Reserves next test will come against Central District at My Money House Oval on Saturday 16 April from 11:25am.